More than 3.4 million passengers flew in and out of Tucson International Airport (TUS) in 2017, a 4.5% increase over 2016. The Tucson Airport Authority announced the numbers at its Annual Meeting on Monday, January 22. December’s total of 299,752, which was up 2.1% over December 2016, continued an 18 consecutive month trend of monthly increases. The final total for the year was 3,433,563. The increases during the year were the result of airlines adding seat capacity by using larger aircraft. Also helping to boost numbers was the introduction of new nonstop flights to San Jose on Alaska Airlines in August and the return of Sun Country Airlines’ seasonal service from Minneapolis in December. Promising signs that the trend could continue are the introductions in early 2018 of two new nonstop routes: Austin, Texas, and Charlotte, NC. The Austin flights began January 18 on Tucson’s newest airline, Via Air. To start the service, the airline is offering flights three days per week, on Mondays, Thursdays and Fridays. The Charlotte flights are set to begin February 15/16 on American Airlines and represent the 20th nonstop destination from TUS. Charlotte is American’s second largest hub, after Dallas-Fort Worth, open up new one-stop connecting opportunities to destinations along the east coast of the U.S. and to the Caribbean. The eastbound flight is scheduled to leave TUS late at night as a red-eye, allowing passengers to connect to more than 70 destinations arriving before lunch time. Passengers who used American Airlines at TUS grew by 7% in 2017, helping it maintain its status for a second consecutive year as the airport’s busiest airline. 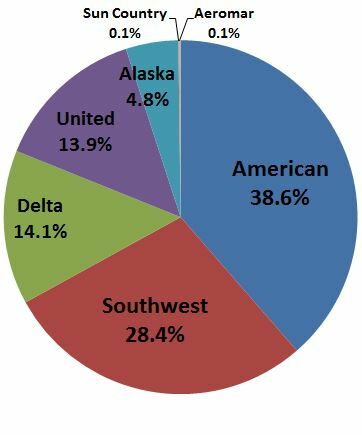 During the year, American served 1,238,199 TUS passengers, or 38.6% of the airport’s total.